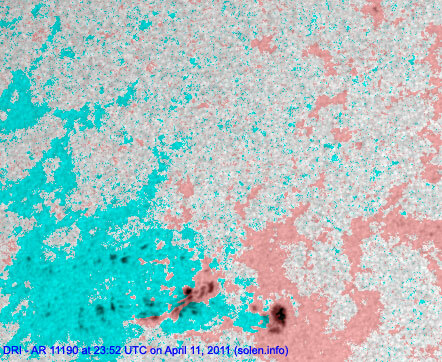 Last major update issued on April 13, 2011 at 04:55 UTC. Minor update posted at 15:00 UTC. 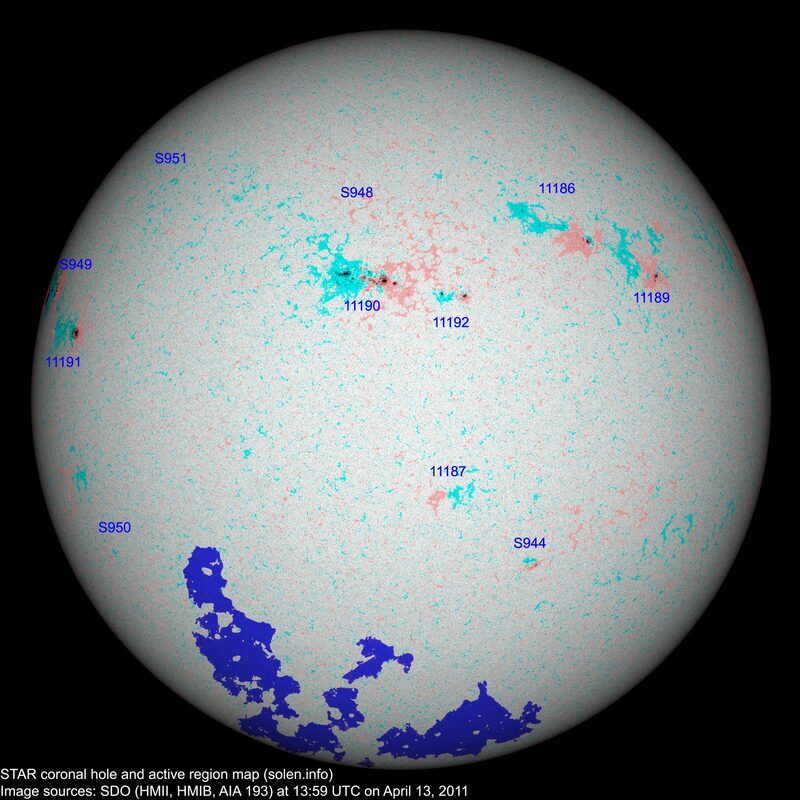 The geomagnetic field was quiet to minor storm on April 12. 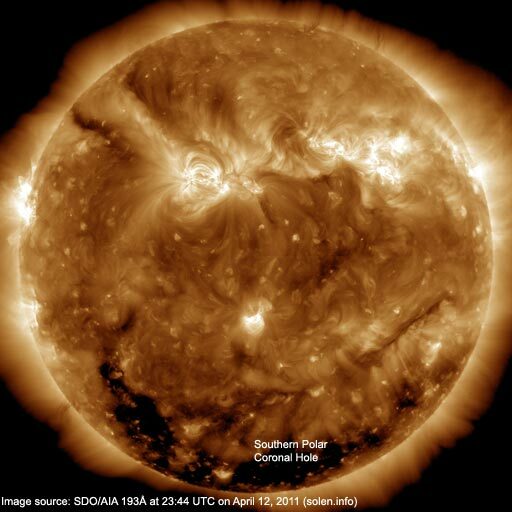 Solar wind speed ranged between 437 and 652 km/s under the influence of a high speed stream originating from an extension of the southern polar coronal hole. 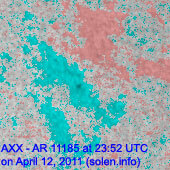 Solar flux estimated at 20h UTC on 2.8 GHz was 110.3 (increasing 16.5 over the last solar rotation). The planetary A index was 23 (STAR Ap - based on the mean of three hour interval ap indices: 23.3). 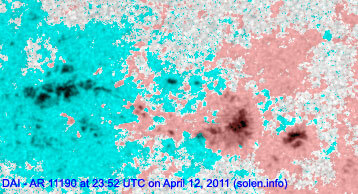 Three hour interval K indices: 22545423 (planetary), 22444412 (Boulder). Region 11185 was quiet and stable. Region 11187 was quiet and still has a few tiny spots. 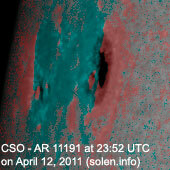 Region 11190 developed further on April 12 and is likely to produce occasional C flares. Some minor polarity intermixing is still present. 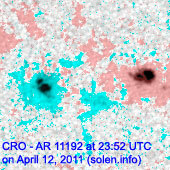 Flares: C1.7/1F at 03:46 and C3.1 at 06:07 UTC. 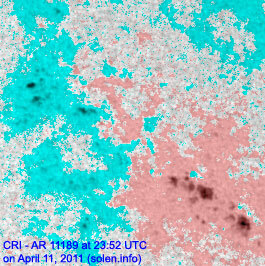 New region 11191 rotated partly into view at the northeast limb on April 11 and was numbered the next day by NOAA/SWPC. No significant changes were observed on April 12. New region 11192 emerged quickly early in the day to the west of region 11190. 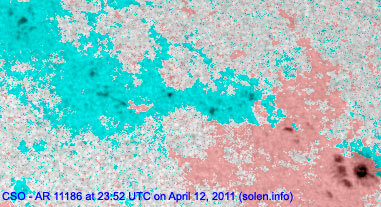 Development slowed significantly as the opposite polarity fields drifted apart. 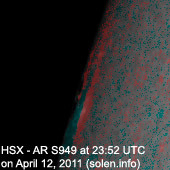 [S949] rotated partly into view at the northeast limb on April 12. Location at midnight: N15E86. 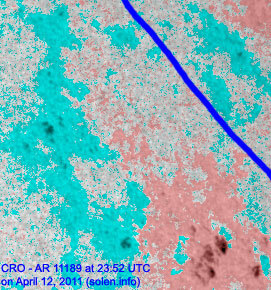 This region could have an interesting magnetic layout based on the activity displayed at the limb. 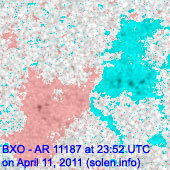 Comment added at 15:00 UTC on April 13: The background xray flux has increased today with region S949 rotating into view. 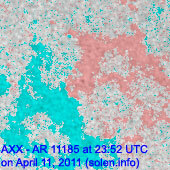 The region at 14 UTC had 15 spots, mixed polarites and a DAC classification. An M class flare is possible. 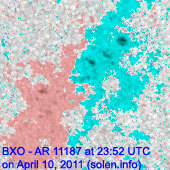 Region S944 has reemerged and was located at S32W24 at 14h UTC with 6 spots and a BXO classification. 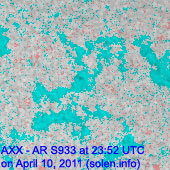 Two new regions have emerged, S950 at S28E61 with 2 spots (BXO) and S951 at N32E47 with a single spot (AXX). 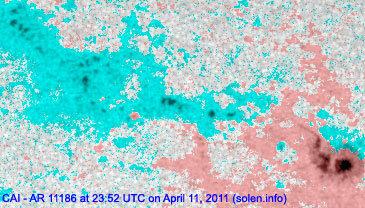 Additionally S948 again has a spot, which means that the total number of spotted regions was 11 at the time of this high resolution STAR CHARMAP. 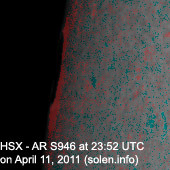 April 10-12: No obviously Earth directed CMEs were observed in LASCO and STEREO imagery. The geomagnetic field is expected to be quiet to active on April 13 and quiet on April 14-15.